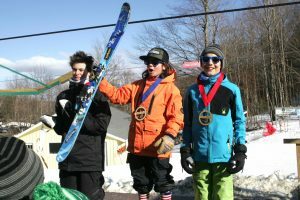 The Mad River Glen Freeski Competition Team is designed for freeskiers ages 10 to 18 (as of December 31st) who want to improve their all mountain skiing through training for, and competing in, Regional and National, International Freeskiers and Snowboarders Association (IFSA) sanctioned events. Prospective participants who are 10 or 11 years of age (U12s) or have otherwise not previously participated in any MRG Freeski program, must pass an on-mountain skills assessment in order to participate in the program. Athletes must be able to ski all of Mad River Glen’s terrain safely and confidently. Competition Team athletes are expected to participate in at least 5 IFSA sanctioned competitions during the season. In order to compete, athletes must have an IFSA membership. Program fees do not include IFSA membership, competition registration fees, additional lift tickets, lodging, and transportation costs. The Competition Team emphasizes skiing to competitive IFSA judging criteria, including line, control, technique, fluidity, and style. NOT Included in the base program fee: MRG season pass, IFSA membership (required), competition fees, lift tickets, lodging, and transportation costs related to competitions. The costs for coach travel and lodging for competitions outside of New England will be split among the athletes who are traveling to the competition. For a complete list of competitions visit the IFSA Junior Events page. To find out more about the International Freeskiers & Snowboarders Association check out the Handbook & Guidelines. Andy Weis grew up skiing at Cochran’s and then Mad River Glen. He has been coaching the freeski team since 2004. In 2009 Andy spent a season coaching the Jackson Hole Ski Club Freeride Team and in 2010 he spent the season freeskiing in Switzerland. He also coaches the boys’ soccer and alpine race teams at South Burlington High School. 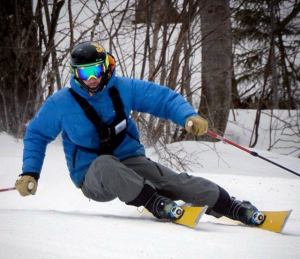 Competitively, Andy has won both the Mad River Glen Triple Crown Unconventional Terrain Competition and the Sugarbush Castlerock Extreme, He has been featured in Powder, Ski, Skiing, Backcountry, and other publications as well as Ski The East’s film “Prime Cut”. He has been Head Judge for the Ski The East Freeride Tour and currently holds PSIA Level 1, IFSA L100, and IFSA Judging certifications. His coaching philosophy centers on helping athletes focus on all turns in all conditions so they are prepared to express themselves in the mountains for a lifetime of skiing. Andy lives in Hinesburg, VT with his wife (and former coach) Cristin, their daughter Ellie, and dog Lucy. Please see the FAQs at the bottom of this page for detailed information regarding Freeski equipment requirements, U12 skills assessment, and other common questions. What equipment is required for a Competition Team athlete? Competition Team athletes are required to wear a helmet, goggles and back protector, mouth guards are highly recommended but not required. Competition Team athletes need to have at least one pair of all mountain skis. Check with program director Ry Young (802-496-3551 ext 121 or ry@madriverglen.com) for recommendations.